For patients with celiac disease, conceiving, delivering, and nursing healthy babies are not insurmountable challenges. With careful attention to diet, mother and baby can enjoy healthy lives. Celiac disease presents a range of concerns for affected individuals. Aside from having to scrutinize every food label, those who eliminate gluten from their diet also eliminate certain essential nutrients they must then obtain from other sources. And when patients with celiac disease decide to have children, they must not only ensure they’re getting enough nutrients to conceive and maintain a healthy pregnancy but also consider how to handle dietary issues once the child is born. Fortunately, a growing body of research is available to help patients meet these challenges. One common misconception about celiac disease is that it affects only the gastrointestinal system. Not so, says Shelley Case, BSc, RD, a member of the medical advisory boards of the Celiac Disease Foundation and Gluten Intolerance Group in the United States and the professional advisory board of the Canadian Celiac Association and author of Gluten-Free Diet: A Comprehensive Resource Guide. To complicate matters, people may have only one symptom, such as anemia with chronic fatigue or irritable bowel symptoms, which can cause them to be misdiagnosed with other conditions. Case says the most common misdiagnoses are heartburn, reflux disease, ulcers, irritable bowel syndrome, chronic fatigue, and fibromyalgia. Worse yet, onset can occur at any age, even in older adults. For these reasons, celiac disease can be very difficult to diagnose. Case estimates that 90% of people who have the disease, which affects 1 in 100 people, don’t know they have it. In the 2008 article “Infertility and Celiac Disease,” Ralph E. Warren, MD, FRCPC, DTM&H, a member of the Canadian Celiac Association Professional Advisory Board, suggests that undiagnosed celiac disease may be a significant contributor to fertility problems in both women and men. In men, documented reduced sperm counts may be due to nutritional and hormonal deficiencies; so if the man is the one with undiagnosed celiac disease, the couple may have difficulties getting pregnant. If a woman with undiagnosed celiac disease is able to become pregnant, there can be repercussions for the fetus. Aside from a higher rate of miscarriage, there may also be a risk of lower birth weight and greater intrauterine growth retardation if the mother has not been diagnosed and treated. “The message is, obviously, we want to get women diagnosed prior to conceiving,” says Case. Warren notes in his article, however, that although most researchers agree on the link between celiac disease and infertility, the belief is not universal. Once a woman eliminates gluten from her diet, she should wait some time for her villi, the fingerlike projections in the intestines that process nutrients and that celiac disease damages, to heal sufficiently before attempting a pregnancy. Case says although there isn’t a standard optimal waiting period, celiac antibody levels should be normalized. “The best advice I can give is that the woman’s celiac disease should be well controlled and the antibodies returned to normal, although just because your antibody levels have returned to normal doesn’t necessarily mean your villi are completely healed,” she says. If physicians aren’t considering celiac disease as a possible cause of infertility, there may be a significant delay in diagnosis. In many cases, women with infertility issues aren’t diagnosed until a family member is diagnosed. In addition, long-term undiagnosed celiac disease leaves people at risk for other medical conditions, such as osteoporosis, thyroid disease, connective tissue diseases, lupus, rheumatoid arthritis, and lymphoma. “We did the largest celiac study in the world—the Canadian Celiac Health Survey—on over 2,600 adults with biopsy-proven celiac, and that delay in diagnosis was 11.7 years,” says Case. “There was a similar study done by Dr. Peter Green at Columbia University at the celiac center there. It was published in The American Journal of Gastroenterology in 2001. The study included over 1,600 Americans. And again, the delay was about 10 years.” A delay of this magnitude can dramatically shorten a woman’s productive child-bearing years. For this reason, Case and Warren recommend that all women with infertility issues be tested for celiac disease. The tests that are most often used to check for celiac disease are the immunoglobulin A (IgA) tissue transglutaminase antibody test and the IgA endomysial antibody test. Case says the tests are 90% to 95% accurate. These antibodies can be elevated due to other conditions, which would result in a false positive, or the tests can produce a false negative if the villi are only slightly damaged. There is also a genetic marker test available as either a blood test or a saliva test. The markers, called HLA-DQ2 and HLA-DQ8, are present in about 30% to 40% of the population that doesn’t have celiac disease, but they are almost always present in people who do have celiac disease. “If the HLA-DQ2 or HLA-DQ8 is negative, it’s highly likely that you won’t have celiac disease because you have to have one of those markers, so it’s a good negative rule out test,” says Case. If these tests are performed and celiac disease isn’t ruled out, an intestinal biopsy will need to be performed to confirm the diagnosis. One of the biggest challenges of maintaining a gluten-free diet is successfully avoiding gluten, which is present in so many foods. Reading labels is of utmost importance. In the United States, the FDA’s Food Allergen Labeling and Consumer Protection Act mandates that companies list the top eight allergens—wheat is one—on any product label. The act does not extend to USDA-regulated foods but, according to Case, the USDA is working on developing similar allergen labeling. Until then, allergen labeling is voluntary, but the USDA reports widespread compliance. She cautions, however, that many people may not be aware of many products that contain gluten, such as licorice, salad dressings, sauces, soy sauce, soups, and certain brands of chocolate and potato chips. Although it can be difficult, it is essential for those with celiac disease to follow the gluten-free diet strictly. “Diet is the treatment,” says Sandquist. Even small amounts of gluten can cause harm. Case says more manufacturers are now enriching their gluten-free products or using more nutritious gluten-free grains, starches, and seeds such as quinoa, amaranth, flax, buckwheat, millet, and teff. “I always encourage my clients to read food labels and look for healthier options to improve the nutritional quality of the diet,” she says. Managing a gluten-free diet can be overwhelming at times and, coupled with a pregnancy, it can seem even more so. “That’s why if they’re thinking of having a pregnancy, they need to work with a registered dietitian who has experience dealing with celiac disease before they get pregnant and during the pregnancy to make sure their diet is meeting their nutritional needs,” says Case. 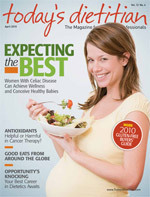 For optimum nutrition, April Rudat, MS Ed, RD, LDN, author of Oh Yes You Can Breastfeed Twins! suggests patients increase protein intake by 15 to 20 g per day, such as by eating two or three extra servings of dairy products per day. She recommends that patients let their thirst guide their fluid intake (preferably water) and that they increase their choline and iodine intake. One thing breast-feeding women should not do is diet, especially if the diet includes less than 1,800 kcal per day. “Generally speaking, breast-feeding mothers need an additional 200 to 500 or more calories per baby breast-fed while lactating,” says Rudat. She says MyPyramid.gov is a good resource for meal plans based on age, height, weight, and whether the woman is pregnant or lactating. Since celiac disease is considered hereditary, some mothers may be concerned about whether to introduce gluten to their babies. But Case cautions that there is not yet enough evidence to draw specific conclusions. For advice about when and how much gluten to introduce in an infant’s diet, she points to the work of Stefano Guandalini, MD, a professor of pediatrics and director of the University of Chicago’s Celiac Disease Center. At the American Gastroenterological Association’s Celiac Disease: Broadening Horizons conference in September 2009, Guandalini addressed the topic of early feeding practices and risk for celiac disease. In a presentation called “Early Feeding Processes and Risk for Celiac Disease,” he summarized several retrospective studies. Guandalini concluded that breast-feeding does have a protective effect for infants at risk for celiac disease, reducing the risk and/or delaying onset. He recommends that mothers of at-risk infants breast-feed up to the age of 1 and introduce small amounts (no more than 1 or 2 teaspoons per day) of gluten-containing cereals between the ages of 4 and 6 months. He noted that introducing gluten prior to the age of 3 months increased the risk of celiac disease, as did introducing large amounts of gluten. Guandalini indicated that a large, prospective multicenter study in the United States is planned to examine the roles of infant nutrition and environmental factors in the development of celiac disease in at-risk infants. One important point to remember, though, is that celiac disease can occur at any time during a person’s life, and pregnancy is a significant trigger.